5 . In rhetoric the speaker or writer almost always deals with probabilities—what could have happened or can happen based on what happens for the most part in such situations. I think there are some interesting resonances between Aristotle’s consideration of dialectic & rhetoric and what is happening in some works we’re reading in other classes right now – namely Byron Hawk’s Counter-History of Composition: Toward Methodologies of Complexity. Whereas Kennedy sees rhetoric as a relatively one-sided affair (the speaker operates canonically to produce a speech), dialectic operates in a two-sided fashion (by definition, right? ); however, rhetoric conceived on Hawk’s terms is multiplicitous and always in the act of becoming/creation. 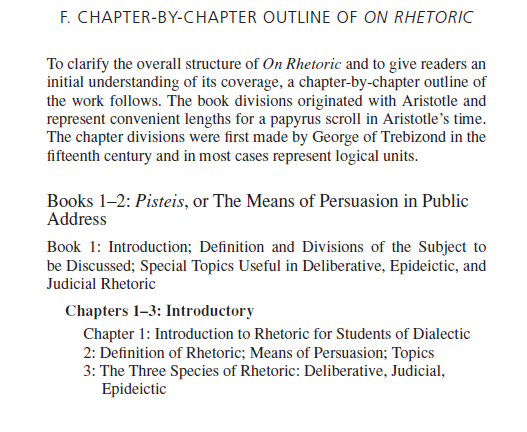 I wonder how much static-ness is attributed to Aristotle’s work because of its operation as a handbook as opposed to a loose set of proscriptions for how to deal with changing rhetorical situations (or ecologies). I wonder if the one-sidedness we see in Kennedy’s description of the “handbook Aristotle” is all that accurate. Despite the influence of Plato it would appear that Aristotle too conceives of argument in terms of probability. He notes this in Book I, Section 11 (34) and again when discussing the enthymeme Book I, Section 14 (42), and again in Book I, Chapter 12 (92-100), and again in the section on “Past and Future Fact” (160-1). I am really interested in how we see the topoi (172-184) operating in Aristotle’s discussion of the rhetorical commonplaces. He provides us with a pretty detailed theory of what particular “commonplaces” yield particular argumentative strategies. My question is one of the relationship between topoi and rhetorical invention. Do we consider the commonplaces as either 1) designed to help writers to create new knowledge (epistemic) and reach new insights and judgments? Or 2) is its purpose to help writers to find and deploy existing information and lines of argument to supports theses or judgments already known? Because they are somewhat proscriptive, the topoi seem to lead rhetors to the discovery of existing knowledge for argumentative purposes. To phrase it differently, Carolyn Miller provides this definition of the topoi: “a hunter may know what they track or may unexpectedly discover new game; however, they do not invent their quarry” – in other words, the topoi may serve as a dwelling place for the hunt; however, the hunter doesn’t simply call into being (invent) the game. 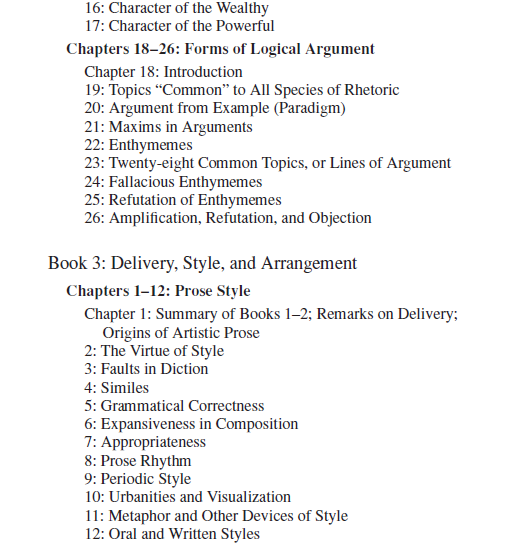 So, according to this perspective, the topoi – and rhetorical invention on a larger scale – offer the student a way to discover lines of argument/theses to support their arguments; however, they aren’t involved in the creation of new knowledge from the topoi. But this too seems unlikely when we consider the specificity of situations wherein the topoi are utilized . . . in other words, all situations might call for a particular line of argument/commonplace as framing; however, the specificity of the situation – the “each particular case” – seems to call for the creation of new knowledge relative to the situation (but still nested inside a broader categorization of commonplace that already exists). 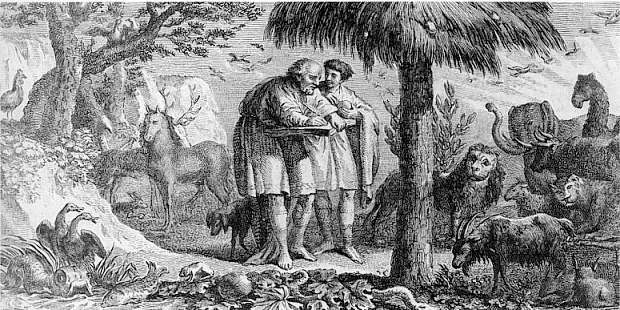 Again, relying on Hawk, the answer might lie in Aristotle’s conception of entelechy. Hawk claims that Aristotle’s notion of “entelechy” is the immanent goal that lies in the process of achieving it. If we think about invention as generative and always developing more (an invention of “and”) then it might be easy to think of the topoi as commonplaces that direct the discovery of new knowledge that is contextual (audience and situation dependent) and always changing. . . . all that sounds awesome; however, how in the world would we ever teach that to students?!? Aristotle notes that different kinds of speech are particularly suited to the aims: 1) amplification is useful for the epideictic; 2) paradigms (predictions based on past examples) are best for deliberative; 3) enthymemes are best for judicial (because of their logical qualities in determining the cause and demonstration of an event that happened in the past) (82-3). Aristotle anticipates – at least to some degree – the Ciceronian “good man speaking well” by noting that some speakers are persuasive because they have practical wisdom (phronesis), virtue (arete), and good will (eunoia) (112). There are further convergences between the two in their unified objection to anger because of its ability to diminish the ethos of the speaker (121-3). Does the section on “fear” give a fairly Machiavellian take on human nature (human beings are naturally inclined toward evil/wrong)? 1. The enthymeme as unifying structure in Rhetoric – strung throughout. Grimaldi’s position. 2. Dialectic (based on syllogism – general premise + minor premise = conclusion) all premises are stated and the general premise is operating on an absolute truth of sorts, rhetoric (based on enthymeme – major premise isn’t necessarily stated,based on probable premises [not absolutes] ). 3. 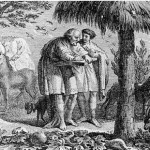 Aristotle’s “to see the available means of persuasion” is a two-fold sort of statement – not to engage in eristic argument, but to speak from a position of the good toward a sort of truth and against the sophistic definition of argumentation as only success – process not product (Kennedy 36). 4. Rhetoric’s utilization of examples (arguments from induction – working from an individual observation of the world) isn’t as preferable to rhetoric as the enthymatic reasoning (working on a shared knowledge of the world). This model is inverted by the empiricists in the 17th/18th century by people like Bacon, Hume, etc.. 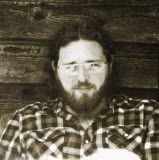 This is a binary about epitemic creation wherein knowledge is either objective/individualist or subjective/collective. 5. 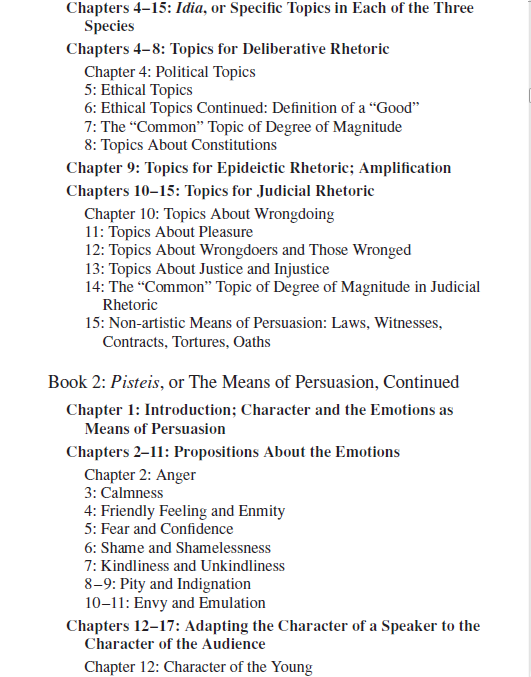 Psychological approach to rhetoric by considering the ways that emotions operate in rhetorical situations (Book II). 6. Fallacies aren’t logically problematic but are often more so problematic based on audience/context/probability (Kennedy 185-9).